It’s incredible how some songs have a dance crazy attached to them which were never originally intended, the prime example being YMCA which, if you watch the original 1978 video, never did the semaphore arm movements which a whole audience will engage in if you have a good DJ to encourage them. This week I focus on a 2004 chart-topper which, the writer never envisaged would become an audience participation act that’s still fully indulged in to this day. The song, which spawned a number of less-successful copycat versions, opens with the line ‘This is something new,’ well it isn’t not. “I wrote Cha Cha Slide in 1996 as an aerobics workout programme for a gym trainer friend of mine called David Wilson and I recorded and released my own version in 1998,” remembered Casper. It made little impact. In 2003 it surfaced in clubs across Europe and All Around The World Records picked it up for a UK release. Although Casper wrote the song, the writing credit contradicts this. It seems that Marvel Thompson, a Chicago gang leader known as ‘King’ Of the Black Disciples, had overseen a drugs operation which raked in over $300,000 a day. He laundered some of the drug money into some legitimate businesses, including M.O.B. Records, which Casper was originally signed to. It led to a six-year investigation by the F.B.I. when he was then arrested and charged with drugs conspiracy. Eventually in March 2005 he pleaded guilty to conspiring with other members of the street gang to distribute cocaine and heroin and was sentenced to 15 years in prison. The infectious two-step novelty song entered the chart at number two, having received virtually no airplay on mainstream radio. In, what was then a sliding singles market, the song made the rare one step climb to number one, the first time a song had climbed to the top since DJ Ötzi in the spring of 2001. 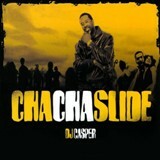 The dance moves to Cha Cha Slide involve Casper getting the audience to slide to the left and then to the right as well as asking them to clap, hop and stomp their feet. There’s still so many who get a bit lost when it comes to the Charlie Brown, the more clued up ladies do it carefully! The follow-up single was another party favourite. Adopting the same instructing method, Casper, using a sample from the Gap Band original, rowed up the chart with a remake of Oops Upside Your Head. We wish him well and hopefully a complete recovery.